San Francisco is the barrio to the south of the main train station. 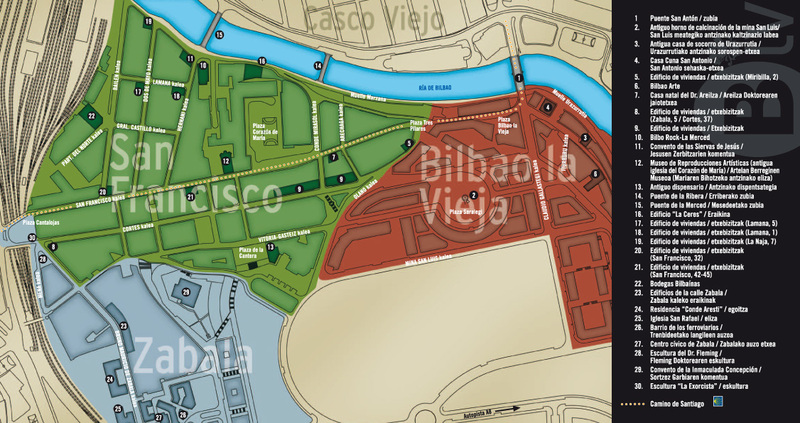 It’s bordered by the river to the north, and barrio La Vieja to the east (see next post). Google map here. Tourist map here. It’s the main immigrant neighbourhood with a large Muslim community and lots of Africans and South Americans. Security is better now than it was apparently, probably because the area is being rapidly gentrified. It still fell a bit edgy walking down San Frantzisko Kalea but I didn’t let that faze me as I live in a similar place myself. I only popped in for a brandy after dinner at La Mina around the corner (see next post) but I like the chilled bohemian vibe straight away. Further investigation is required. A pleasant restaurant and tapas bar well located on a raised position by the river. It’s near the Erriberako Zubia, a footbridge that takes you over the river into the Casco Viejo. Apparently Frank Gehry was inspired by the dark blue paint used in the interior of El Perro Chico, a favourite hangout of his, for the colour of the office block at the Guggenheim. If it’s good enough for him, it’s good enough for me. From the tapas menu I tried the Mix de Gyozas, served with mayo as well as a soya sauce dip. There were two kinds; Cerdo y Ajetes, pork with young garlic (B+) and Hongos y Parmesana, mushrooms with Parmesan (B+). They were a nice variation on the traditional Japanese fried dumplings which are usually filled with pork or chicken mince. They were good, but a bit expensive at €8. I’d like to come back and try their menu. They were full on a Saturday night so it’s best to reserve if you go at busy times. There are lots of other interesting bars and restaurants in this up and coming area. I ended up in a buzzing South American bar along San Frantzisko Kalea one night but blowed if I can remember where! I’ll be back to check on developments next time I’m in town. This entry was posted on October 28, 2017 at 7:15 am and is filed under Basque Country, Bilbao, San Francisco, Spain with tags Bar Restaurante Peso Neto, El Perro Chico. You can follow any responses to this entry through the RSS 2.0 feed. You can leave a response, or trackback from your own site.